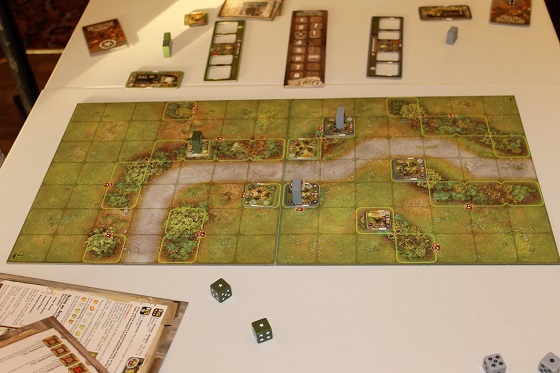 Last Monday we had a mix of games from a first try out of a kick-starter financed game Heroes of Normandie plus the usual mix for wargames and boardgames. 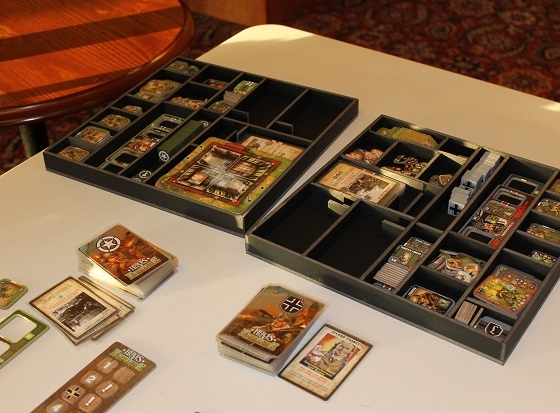 Heroes of Normandie WW2 strategy wargame inspired by Hollywood war movies. 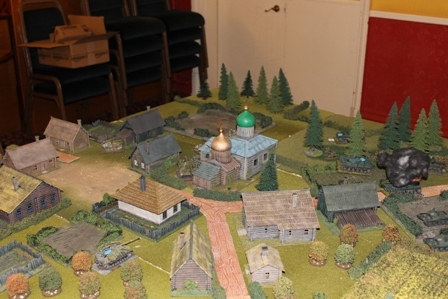 A tactical scale board-game opposing two players and two armies, with the Germans on one side and the Americans on the other. 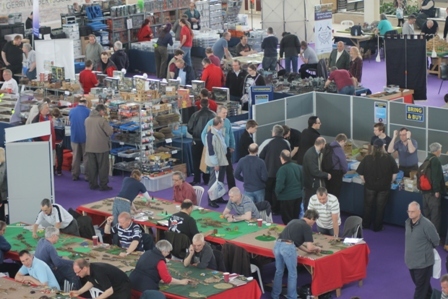 Players use order tokens to determine initiative and to bluff. 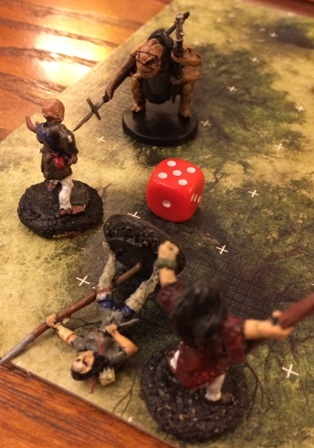 While a single six-sided die determines combat, action cards are played to spice things up. Secretly plan your attacks and outwit your opponent. 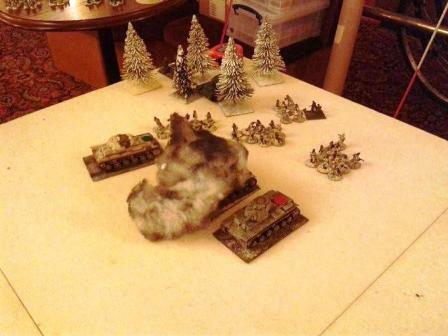 Block the opposing strategy and surprise the enemies. 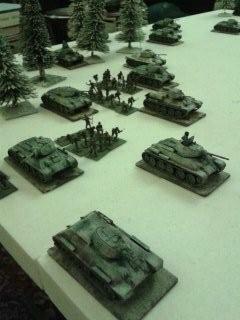 Deploy your units and don’t turn back! 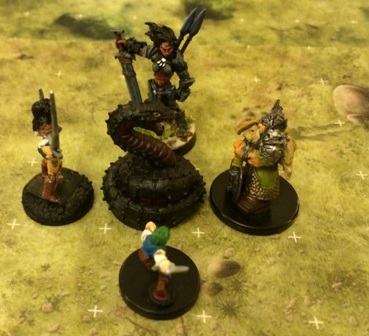 Our latest role playing game is a pathfinder based one being run by Steve. It is set in an late dark ages society – with some civilised city states ala Athens. 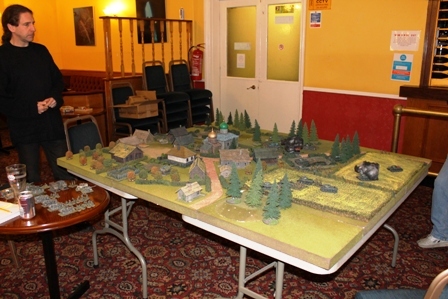 The last session centred around an attack on a village we where staying at whilst investigating unusual goings on. With the start of the commemoration of ww1 I thought I woudl post this setting by a chap called butterworth of poem that a friend shared with me. Butterworth was an interesting chap. He was directed by his parents to study law, but became interested in music and followed that instead. However, he never felt he did it well, and held a succession of music-related jobs (critic, teacher) whilst lacking the confidence to follow a career as a composer. He destroyed many of his compositions. When WWI broke out, he decided he had a role in life and signed up as a rank and file soldier immediately. Within a year he gained a commission and a reputation as a good leader. In 1916 he was awarded the Military Cross for his bravery in defending a trench, which was named after him. A week later he was shot in the head by a sniper and killed at the Somme, never knowing of his award. 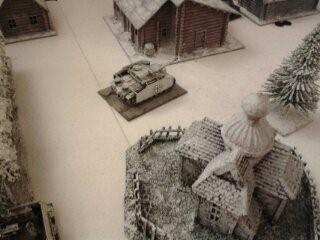 More ww2 Soviet vs German last Monday gone saw the debut of some new scratch built terrain in a ww2 mid war soviet vs German match up. 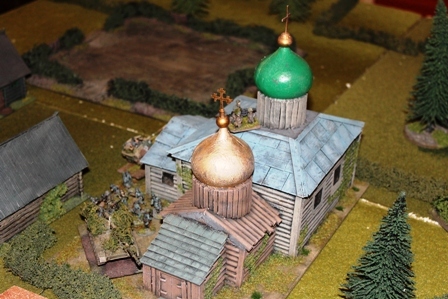 Steve has built a nicely rundown Orthodox church to provide a focus for this battle – the domes remind me of the Olympic opening ceremony. 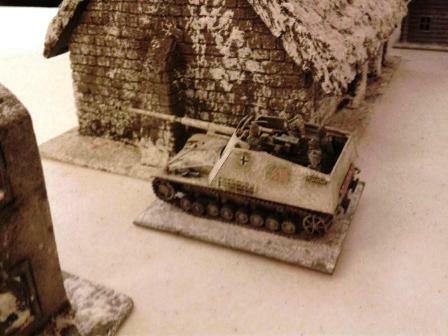 And a longer shot – note the detachable cross on top of the dome. 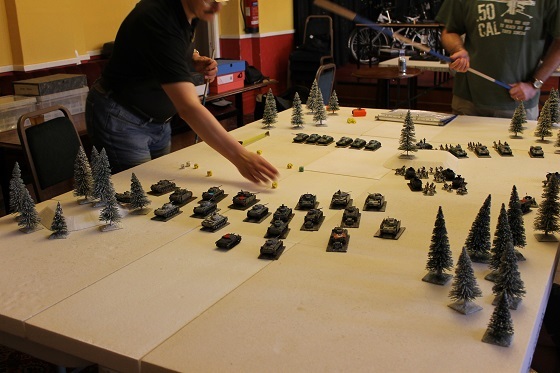 Last Monday we had a naval war game of the battle of Tsushima which was the climatic naval engagement of the Russo Japanese war. Russia sent most of their Baltic fleet all the way around the world (nearly starting a war with the UK when the fired upon British trawlers in the north sea mistaking them for enemy torpedo boats). 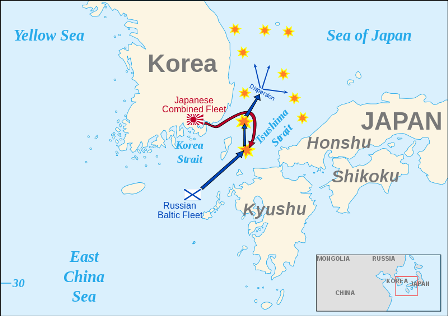 The fleet set off on the 15th of October 1904 and The Action was fought on May 27–28, 1905 in the Tsushima Strait between Korea and southern Japan. 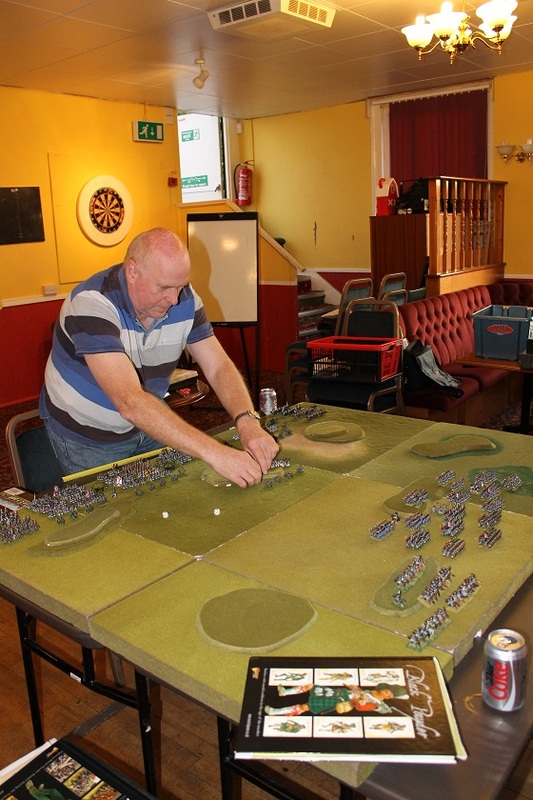 As large scale model ships are expensive and require a lot of space only 5 ships where used though we do have a suitable space to play out large scale navel battles ala Fletcher Pratt – this would have to wait for one of our club member to win the lottery. 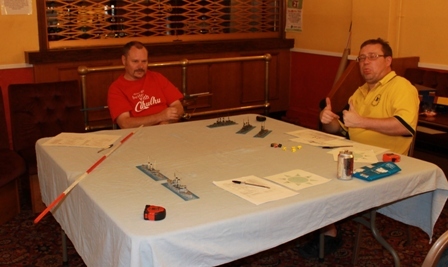 First we see the start of the battle with the Russian admiral (Steve) in Yellow expressing his confidence – Ironically a lucky shot very early in the game hit the bridge and killed his Russian Admiral. 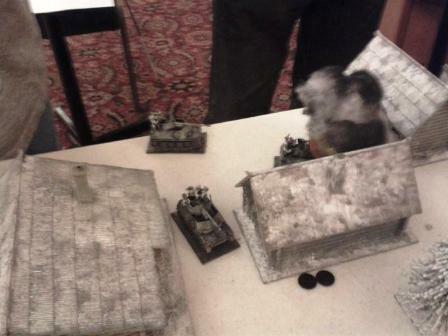 The game went better for the Russian side than it did real life with a magazine hit on the last turn on the night which took out one of the Japanese battle ship. 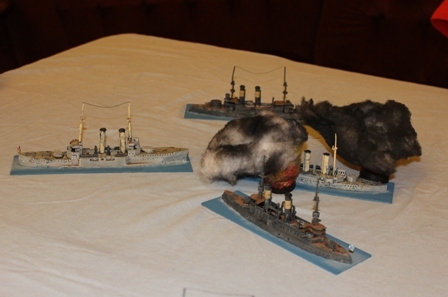 In reality the Japanese fleet inflicted a crushing and total defeat of the Russian fleet . 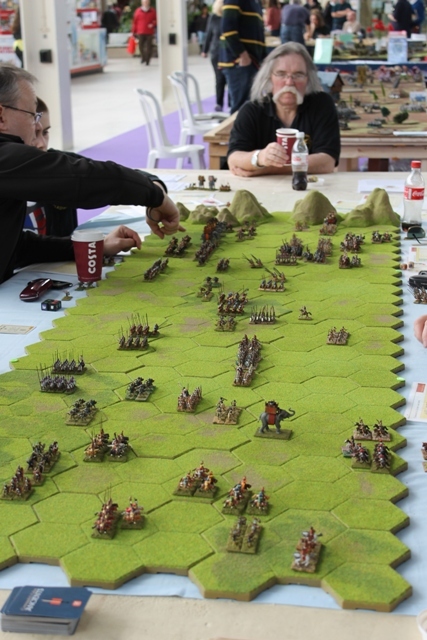 We took a different type of game this year opting to adapt the command and colours board game to a larger board and to use 15 mm figures. 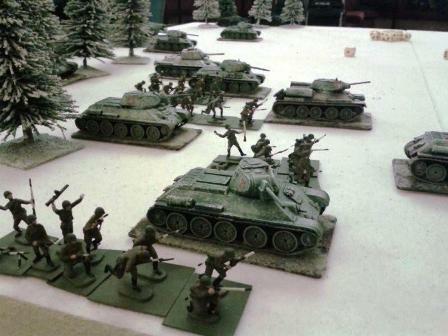 The game is unusual in that there are 4 players a side an overall general and left centre and right flank sub generals. Paraitacene is a battle that occurred in the wars of the successors after Alexander the great died. between Antigonus (one eye) and Eumenes. It was fought in 317 BC. 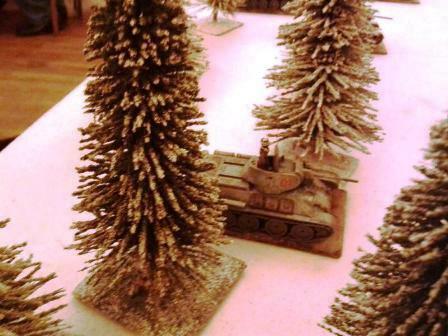 You can see the layout later in the battle here with One Eye on the right. 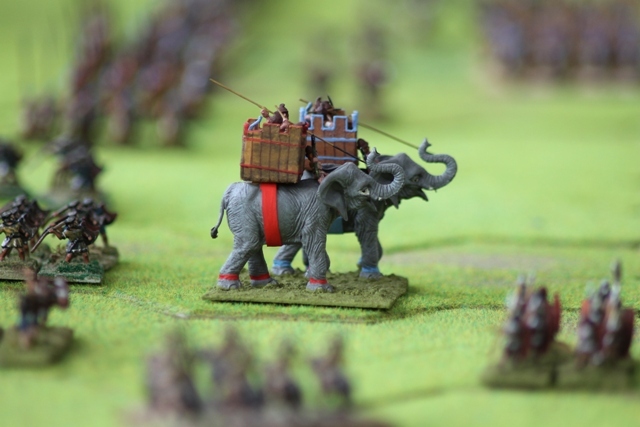 A close up of elephants attacking note that these are scratch built models using Britains baby elephants as the base figure. Campaign is held in Middleton hall and has a large attendance as this shot from the balcony of John Lewis shows. 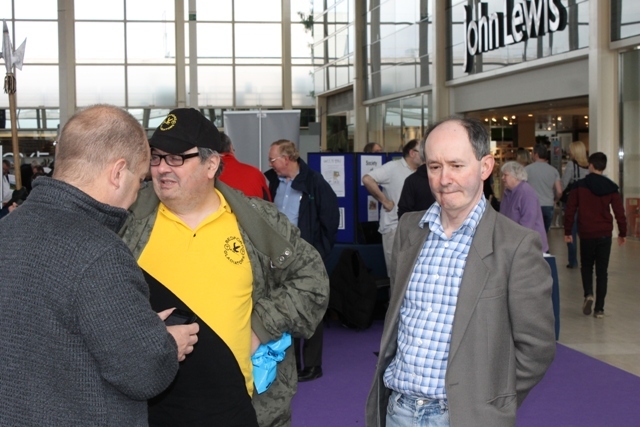 We also had blast from the past and a flying visit from Jim one of the founder members of the club and know to us as older types as the guy who ran the model side of Gascoignes in Bedford.